I'm not excited to see the first movie because I thought this Twilight rave is just for girls. And yes true enough, when I watched it, it didn't really give that much impact on me. 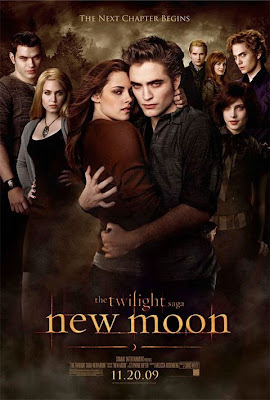 But when I saw the trailer of the second Movie New Moon it tickles something on me that makes me interested to see it. Here are the 3 new posters for the film. The first Poster features the Cullens together with Bella, the second is the Volturi clan lead by Dakota Fanning as Jane and lastly the Wolf pack headed by Taylor Lautner as Jacob. Below is the latest trailer of the film showing more scenes that are very engaging compared to the first teaser they've shown us on MTV Movie Awards. At this point I'm completely convinced that Dakota is 8 years old no more. I'm very sure non and twilight fans alike are both excited to see how the book is transformed into the film. Will it be a disappointment or will it be a success? Let's find out on November 20, 2009 in cinemas worldwide.